There isn't any particular reason why I decided to treat myself today. It wasn't really going to be a treat either because I'm never one to deprive myself when it comes to shopping. 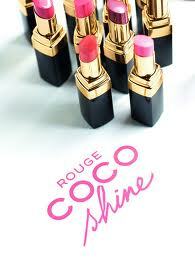 I've been coveting the new Chanel Rouge Coco Shine lipstcks. I'm completely addicted to the youtube beauty community and I've heard loads of good things about them around there. Then yesterday, the sun was shining, my music was particulary good and Vanessa Paradis was looking at me from the back of my Cosmopolitan magazine as I stood waiting for the children I work with to finish school. Life was good, so I decided that I deserved a Rouge Coco Shine, you know, just to make life that extra bit more special. I went into Sephora on the Champs-Elysees today to get mine (yes - it is completely overcrowed with tourists and thier boyfriends but you just can't beat the range they have in that store). 10 minutes and as many swatches on my hand later, I decided on "Boy". That was until I discovered the €29.90 price tag. As nice as it would be to have the sleek black lipstick in my bag, I can't justify it just yet. I really need a reason to treat myself, other than "just because it's sunny and I'm happy". I think "after my dissertation is handed in" is a good compromise.